The man is obviously well-versed in illuminati propaganda techniques, which usually employ in-your-face double-speak. Because Estonia is not even remotely close to Britain’s doorstep. It is over one thousand miles from British shores and far from signalling NATO’s willingness to deter Russian aggression, the drills seem intended to telegraph a veiled threat to Moscow. What else can one conclude from war games that are being conducted right on Russia’s very doorstep? Moreover, these drills are only the latest the Western military alliance has conducted close to Russia’s western border, and they’ve not only taken place in Estonia. Other NATO drills have recently been conducted in Poland, Lithuania, Bulgaria, Hungary and Romania. Over the past few years U.S. and NATO forces have steadily crept ever closer to Russia’s western borders. Conducting war games with new found allies in eastern Europe as well as establishing and training new “battlegroups“. Moscow understandably views claims that these drills are meant to deter “Russian aggression” with some scepticism. One can only imagine the outcry if Russia were to conduct similar drills in European countries that were not NATO members, like the Republic of Ireland, or Cyprus or, heaven forbid, Sweden. They would been seen by the West as tantamount to a virtual declaration of war. So what is NATO doing? Williamson’s justification for war games so close to Russia is obviously false. So does he think that the Western public are really so stupid that they will swallow his reasoning? Or are his comments a result of the arrogance of a man who knows that he’s been marked for a higher position in power? Williamson’s rise since he was first elected to parliament in 2010 has been described as “meteoric“. One insight may be gleaned from the fact that Williamson kept a pet tarantula spider in his desk at the Ministry of Defence. It has since been removed but what does this say about the man and, by extension, those who may be behind him? Ed. Hundreds of British soldiers have been deployed to Estonia to take part in ultra-realistic war games and offer military deterrence against Russia. More than 800 UK personnel are currently stationed in the Baltic state as part of a Nato group alongside Danish, Canadian and Estonian forces. The deployment of troops is a bid to deter Russian aggression and prove Nato is a “very capable force” ready to deal with a raft of threats, a senior UK officer has said. The British Army is providing the bulk of the numbers through the armoured infantry task force of the 1st Battalion The Royal Welsh. Senior Major of The Royal Welsh, Darren Hughes, said his troops are aware of why they are in Estonia. Asked whether the threat from Russia is a credible one, the 43-year-old from Rhyl, North Wales, said: “In as much as is Russia a potent military force? Absolutely. “They are a very professional organisation. Are they a threat to us day to day? No, they are not. “We are showing the fact that should situations worsen, then an armoured infantry battlegroup is a very credible fighting force. The troops have taken part in a huge military drill over the past nine days. Undertaking a series of attack and defence manoeuvres against their Estonian allies, troops simulated conflict as they fired blanks at each other inside a military training zone just north-west of their camp in the town of Tapa. Lieutenant Anthony Strain, from St Albans, Hertfordshire, said such exercises are “incredibly important”. 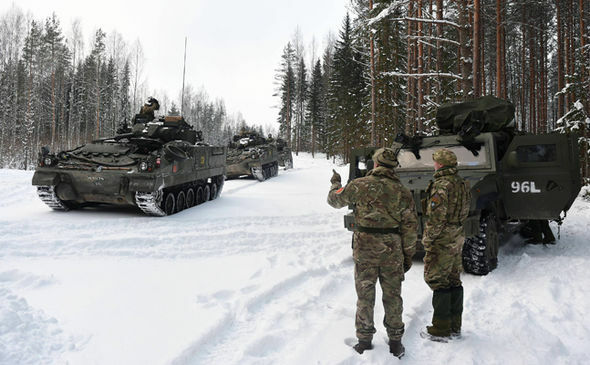 With temperatures dropping down to -19C at one point, Lt Strain said dealing with the cold has been a “massive challenge” as the British Army is used to windy, rainy and more temperate environments. Tanks shot out different coloured flares and blanks instead of live ammunition, the exercise was made realistic by the actions of numerous umpires. They would often tell soldiers on both sides they had been killed, resulting in them having to lie flat on the ground, or that they had been injured – allowing the practice of battle casualty drills for a variety of medical situations. 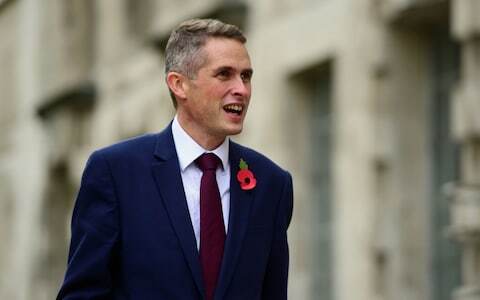 Defence Secretary Gavin Williamson said in Estonia it is evident that the UK is “taking the lead on the global stage and crucial role in keeping us safe and protecting our national interests from those who wish to harm us”. He added: ”We live in a world where the threats and dangers we face to our way of life are constantly evolving and increasingly challenging. “We have to be deeply committed to counter the intensifying aggression aimed at Britain and our allies from the Russian State.